In the 1870’s San Francisco became too crowded for John Wesley Hammond. The Homestead Act allowed John Wesley Hammond to claim unused government land. The best land in the Napa Valley was gone with seemingly only less desirable outlying land available. John found available land on Atlas Peak, above the fog, with rich, red soil and lots of sun. Atlas Peak is now recognized as a premier appellation. First to homesteading a 40 acre parcel, then moving up to the present ranch site of 240 acres. John planted grapes, fig trees and olive trees with trees of both species remaining in production today. 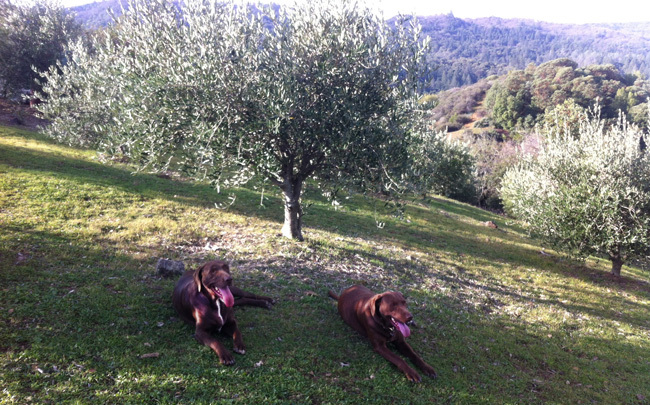 Today the ranch is filled with hundreds of olive trees that fill the hillsides. On the east side of the ranch we have arbequina varietal and on the west side of the ranch there is the Italian varietal Pendolino, Leccino, Frantoio, Maurino and Coratina. We have the old Mission olive trees that were planted in the 1800’s. Over a century and five generations later, the ranch is as busy as ever. Today our crops pay homage to their European roots. With an elevation of nearly 2,000 feet, hot summers and cold winters- the conditions are perfect to cultivate Tuscan and Spanish blends of olive oil. John Wesley Hammond became well known for his figs, grapes and olives and supported himself living year round on the ranch with his horse “Babe”. John disappeared from the ranch in 1933 when he was in his 80’s. Leaving his gun behind the door, a half a plate of eggs, and a half a cup of coffee on the table, he was discovered missing by his son George W. Hammond and grandson George E Hammond. No trace of John Wesley has ever been found. Support the Napa Valley region with your purchase of premium local olive oil!